SpokeFest will be Sunday in downtown Spokane. Visit www.spokefest.org for information. If you would like to donate money for the bike trailer, contact Broadway Elementary at (509) 228-4100. The children held their left arms out straight while their right hands clung to their bike handlebars, trying to maintain their balance while they made their left turn signals. Most of them were a little shaky at first, but they got the hang of it. The kids were at Broadway Elementary in the Central Valley School District last week, to test drive new bicycles the district purchased thanks to a $6,100 grant from SpokeFest. Katie Ferris, the physical education teacher at Broadway, applied for the grant and received enough from SpokeFest for 30 bikes and helmets. 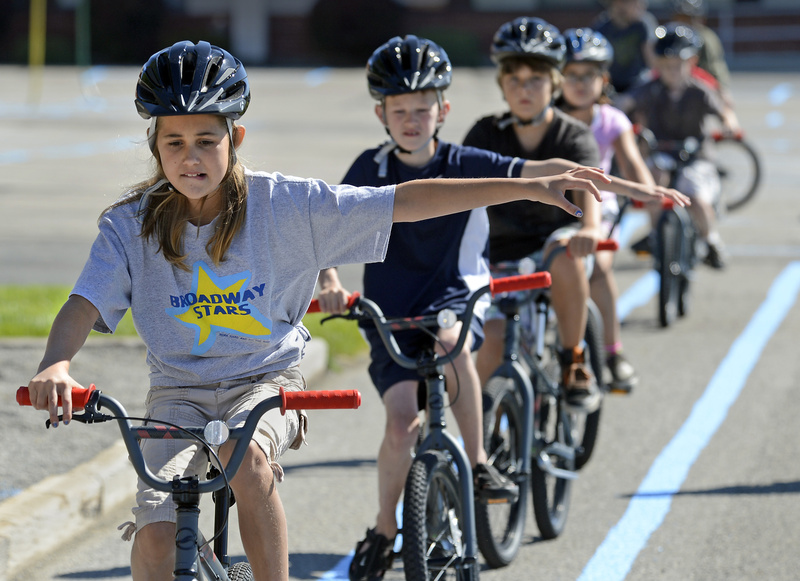 The bikes will be taken to all of the elementary schools this year so all fourth- and fifth-grade students can take a three-week unit in bicycle safety. Jeffery Adams of SpokeFest said biking is for everyone and teaching students about bike safety is very important. “It’s not just bikes,” he said of SpokeFest. He said the CVSD proposal stood out because Ferris had done her homework before she applied. The district had a place to purchase the bikes, a plan laid out for their use and a connection to Sheriff Community Oriented Policing Effort. “They did so much work themselves,” he said. Helmets came with the grant and SCOPE executive director Rick Scott was at Broadway to help fit the helmets to the children. He said each helmet should fit the head snugly and there should be room for two fingers between the top of the eyebrows and the brim of the helmet. Spokane Valley does not have a helmet ordinance in place, but Scott said he is working to educate people about their importance and get them into the habit of wearing them. “We tell them they have to wear them,” Ferris said. She said transporting the bikes can be difficult – they are using school transportation to get them from place to place – and she is in the process of setting up a fund to buy a trailer. The bikes – Giant GFR, BMX-style bikes – were purchased at the Bike Hub in Spokane Valley. Employees there put together each one. Lela Johnson, 10, is a fifth-grader at Broadway. She said she learned a little about bike safety last week and had a fun time riding the bikes. With her was Micah Reed, also 10 and a fifth-grader. She said she rides her bike to school every day, even in the winter. “It’s really fun to help people ride bikes,” she said. An experienced rider, she also noted the importance of bicycle safety.